We are nearly half way through the year and I thought I’d have had that darn book done by now, but I am making steady progress. This includes cover art, which the very talented (and patient) Cindy Bamford has been working hard to create despite my total lack of direction. I am happy to say that, as usual, she has come up with something wonderful that shall be revealed very soon. I also plan to give you all another sneak peak of the story soon, but keep an eye on Twitter for random snippets as I move along. In other news, it’s hot!! Damned hot! And raining way too much here for my likes. Although, the rain does make it cooler, as long as the sun stays away, and if it doesn’t, it’s sauna city. Stupid Florida!! On the plus side, in a few days my wife and I will escape to beautiful Oregon with some friends for a week of debauchery in the great outdoors. Well, mostly outdoors. Bend is a beer drinker’s paradise. I’m a whiskey gal, but most of them do love their hops. If you’ve read my book “Switchback,” you’ll already know two of our fav places. We also hope to take in a quick bit of Central Oregon Pride in Bend before heading out. I’ll be sure to share some pics on social media and in next month’s blog. Now, enough about me. I welcome you all back for the June edition of the Author Meet & Greet. This month we feature the wonderful Lila Bruce. I had the pleasure of meeting her in Gulfport, Fl at the ReadOut event earlier this year. 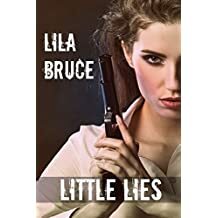 Lila has penned several novels including Rainbow Award winners “Love Bites,” 2016 best romantic comedy, and “Little Lies,” 2017 best romantic suspense. If you love a good romance read, Lila has a little something for every palate. I’ve been writing in some capacity ever since my fifth grade teacher, Mrs. Kelb, assigned the class a short story project. I wrote poems and little stories all the way through middle and high school, but then fell out of the habit in college. I picked up the bug again about 5 or 6 years ago after getting into a debate about books with an author friend of mine who is lesbian but does not write lesbian fiction. I started playing around with some ideas and ended up writing The Scent of Jasmine. How do you feel your background influences your writing? I’ve grew up a little bit of everywhere, which exposed me to lots of different types of people. And being a lesbian in Georgia, living in a part of the state that is very conservative, colors the way I see and interact with the world. That naturally carries over into my stories, into the characters and how they interact with each other. What do you like most about writing romance and/or suspense? Do you prefer one or the other? Second question first — when asked, I always say that I write romance, so I guess I prefer that tag. I enjoy plotting and trying to put little pieces of the puzzle throughout the story so that it all comes together at the end. Basset Hounds and cats…I love the photos you post. Great looking kids. If you could have any other animal as a pet, what would it be? Thank you. They pretty much run the household. I’ve had a little bit of every kind of pet over the years, from fish to hamsters to Big Al the Chinese water dragon. But, if I had to pick…my girlfriend has a gorgeous blue and gold macaw. I had never fancied myself a bird person until I met Eden (that’s the macaw). She’s quite the conversationalist and actually has a cute sense of humor. You’re a coffee lover. How do you take your coffee? Seriously, very seriously. And preferably with two Splendas and a splash of French vanilla creamer. As you say in your bio, you grew up military, so you’ve lived many places, which was your favorite? I would have to say Germany. We were stationed in Bitburg for about five years in 80s. The German people were always friendly and very welcoming. My parents liked the great outdoors, so we traveled to campgrounds all over southern Germany, Belgium, Luxembourg, and France. It was a fun way to see that part of the world. That’s a hard question. If I had to chose, I would say Nana from Hurt. She’s just a supporting character, but one that I modeled after my own grandmother, so she holds a special place in my heart. I’m about a third of the way into my next book, which I’ve yet to name. It’s a little different from others that I’ve written in that this one is a romantic suspense that has a pinch of the paranormal in it. Let’s see… I’m also working on a Christmas short story/novella, and have been outlining the sequel to Love Bites. You write lesbian romance and suspense. What inspires your suspense plots? Congrats on “Little Lies” winning the Rainbow Award for best lesbian romantic suspense 2017, by the way. That’s fantastic! Thank you. Little Lies was a fun book to write. What inspires my plots? I’m a child of the 80s, so I grew up watching Remington Steele, Hart to Hart, Matt Houston, Moonlighting, Charlie’s Angels…pretty much anything that involved a private detective agency and a strong female lead. Cheesecake, preferably of the key lime variety. My girlfriend and I own and show British Shorthair cats. We go to about six or seven shows a years. Cat competitions are basically beauty pageants for cats, in case you’re wondering. (I’ve had people ask me how they get the cats to do all those tricks like dogs do in their shows.) I get a kick out of all the different types of people and cats that you see at the shows. And TICA (The International Cat Association) always has a local feline rescue organization at their shows. The rescue gets donations from attendees, and the cats they bring get a lot of attention. The last show that I was at, six rescue cats got adopted during the show weekend. Lila Bruce makes her home in the mountains of North Georgia, where the air is sweet and the summers are hot. Growing up in a military family, she traveled extensively as a child, living everywhere from Maine to Mississippi, Germany to Georgia, and a few parts in between. Lila loves to read and write contemporary lesbian romances, and is a sucker for a happy ending. Thank you all for reading. Join me again next month when I will hopefully have a tentative release date for my next book as well as a chat with debut author and blogger, Lynn Lawler.